Use Deduper for Outlook to clean up your Outlook from duplicate items of any type in no time. 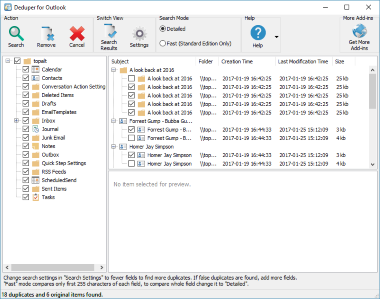 Search and remove all types of duplicates (appointments, contacts, emails (messages), journal, notes and tasks) with this outlook duplicate remover. Deduper search is customizable to accurately identify all duplicates. It can search across different folders. Find duplicates quickly - start searching with just one mouse click!